The 7 commandos were shot before dawn on 23rd October 1942. After their capture and before their day of execution, on the 18th to be precise, Adolf Hitler signed a decree which sealed their, and all subsequent captured commandos, fate. There appears to be no other Commando mission on or around these exact dates so one might tentatively assume the success of the ‘Musketoon’ Mission led to the decree. “From now on, all opponents brought to battle by German troops in so-called commando operations in Europe or in Africa, even when it is outwardly a matter of soldiers in uniform or demolition parties with or without weapons, are to be exterminated to the last man in battle or while in flight. In these cases it is immaterial whether they are landed for their operations by ship or aeroplane or descend by parachute. Even should these individuals, on their being discovered, make as if to surrender, all quarter is to be denied them on principle. 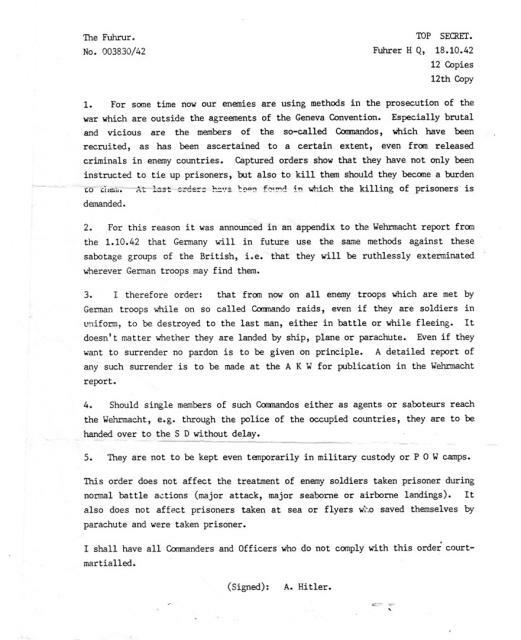 A detailed report is to be sent to the OKW on each separate case for publication in the Wehrmact Communique. “If individual members of such commandos working as agents, saboteurs, etc, fall in to the hands of the Wehrmact by other means – e.g. through the police in any of the Counties occupied by us – they are to be handed over to the SD immediately. It is strictly forbidden to hold them in military custody e.g. in PW camps, etc, even as a temporary measure. “This instruction does not apply to the treatment of those enemy soldiers who are taken prisoner in open battle or who surrender in the course of normal battle operations (offensives, large scale landing operations and large scale air landing operations). Equally little does this regulation apply to enemy soldiers who have fallen into our hands after naval encounters or are seeking to save their lives by parachute after air battles. “Now this decree as it stood was almost a legitimate order. According to the accepted rules of conduct in war, there was nothing illegal about the idea of “no quarter being given” – in short, a policy of complete extermination of the enemy during combat, a policy that could be applied equally to Commando raiders and to units on any field of battle. The legitimacy of such an order, however, is determined by one condition: it may be issued by a commander on the strict understanding that it’s terms are made known not only to his own troops but also to the enemy. What turned the Befehl into a totally illegal document was the plain, undeniable fact that it was marked “Top Secret”. In addition, it was accompanied by a lengthly note of explanation – also top secret – giving the Fuehrer’s reasons for the decree. It ended abruptly with the odd statement: “Should it prove advisable to spare one or two men in the first instance for interrogation reasons, they are to be shot immediately after their interrogation”… a conclusion that seemed strangely contradictory to the terms of the actual Befehl. The Befehl was illegal by virtue of its top-secret nature, but it was not in itself an order to murder, despite the confusion arising out of the “shooting” reference at the end of Hitler’s accompanying notes. It is interesting to recall that both Rommel and Kesselring received the Befehl and refrained from passing it on to the officers under their command. Alone of the German generals who got the Fuehrer’s document, Nicholas von Falkenhorst decided to invest it with a truly lethal force. He took it upon himself, indeed, to go one better than Hitler. For in Norway Falkenhorst issued his own version of the Befehl, and added to its ruthless character in a peculiar savage fashion. Riveting his attention on the final words of Hitler’s explanatory note, Falkenhorst’s order contained the startling new provision: “IF A MAN IS SAVED FOR INTERROGATION HE MUST NOT SURVIVE HIS COMRADES FOR MORE THAN TWENTY-FOUR HOURS”. The Musketoon Commandos fate was sealed.